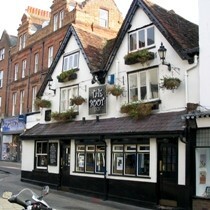 The Boot in St Albans is a great old fashioned character pub with an excellent selection of beer. It normally has Youngs Special and Deuchars IPA available as well as four or five unusual guest ales. The selection of wines and continental lagers is also good. With its low ceiling this pub can get very smoky although this will be resolved when the smoking ban comes in this summer. There are a few tables to the front and sides of the pub but during the evenings the pub gets busy and many drinkers stand. The Boot doesn't have a jukebox or games machines but it does have a great atmosphere. Good 80's music on a Saturday evening but often there is no background music, which is not a bad thing. Quiz nights are held on Mondays and occasionally there are live music nights .It has late opening on most nights.